That's the summit of Mt. Warlow in the Evolution group of peaks in the High Sierra. And that's Alex. 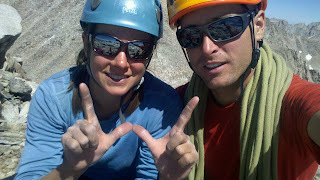 She's smiling because its funny to make the "W" symbol, and because we are psyched to be nearly finishing the Evolution Traverse! The Evolution Traverse is a high altitude rock climb that connects 8 (or 10 or more, depending on how you count) peaks in a spectacular chunk of the world's greatest (?) mountain range. This particular combination of peaks, logically connected by technical ridgeline, was first traversed in its entirety in 1999. The route and its challenges and history first came into the periphery of my awareness ten years ago. It has gradually crept into my head, until this year, in the end of August, we spent 5 days fully consumed in its challenges and splendor. Now, there are a number of things that made this experience special to me. This was the first big endeavor Alex and I undertook together. This traverse is the "youngest" major climb I have ever been involved with. It is also perhaps the hardest route I have ever completed. I hope to expand on our experience out there here in these pages. The impact of it all is still sinking in. For someone who makes a life and a living out of challenging himself and others in the mountains, looking closely at a single endeavor is a different sort of exercise. As I type now, just 3 weeks later, I am lying in a windy tent in the Palisades group of peaks. Since the Evolution Traverse I have made 4 more significant trips to the mountains. Indulge me as I attempt to look back and look closer at this one trip, all while continuing to live a life.